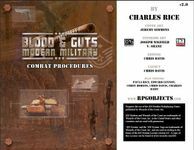 Welcome to book two of the revamped and updated Blood and Guts, the Combat Procedures Manual. This book offers a plethora of new and modified rules to make your combats gritty, dangerous or just plain realistic enough to suit the kind of campaign you want to run. One of the most popular sections of the original Blood and Guts was the optional combat rules section, which gave game masters a number of options to dial the lethality of their campaign up to the appropriate level of grittiness. This book is the descendant of that section, expanded, updated and made even wickeder than it was before.